Granite State Ambassadors are contracting partners for the New Hampshire Division of Travel & Tourism Development to assist with the planning, volunteer management, and onsite management of the New Hampshire Tourism Information booth within the New Hampshire building on the Eastern States Exposition grounds in West Springfield, MA for the Big E (September 13-29, 2019). We’re looking for friendly, happy people to volunteer at NH Tourism Booth in the NH Building at The Big E in Springfield, MA. GSA volunteers, friends, and tourism industry folks are invited to volunteer during the 17 day fair. GSA volunteers will receive special event service hours. All volunteers will receive a free ticket to the fair for the day(s) of their volunteer shift(s). Travel and accommodations are on-your-own, but we’ve researched a few options that are listed below. We look forward to seeing you at the fair! If you are a NH tourism business and are interested in having your literature displayed at the NH Tourism Booth, contact bige@livefree.nh.gov. There will be an orientation meeting at the Division of Travel and Tourism offices in Concord on ________ (September), 10am-noon. While attendance is not required to volunteer, it is strongly recommended that you attend the orientation, especially if you’ve never volunteered before or haven’t been to the orientation in a year or two. Orientation is where you will receive your parking directions and tickets. Please sign up for orientation while you’re signing up for your shifts! We will have a debriefing meeting (and pizza party!) after the fair October ___, 11am-noon to hear your feedback. Click here to sign up for shifts on the online calendar, as you would for anything else. Do NOT fill out the registration form. If you are not a GSA – read this first! Note: if you volunteered last year, the account you created should still work. You can skip step 1. There is a link to reset forgotten passwords. CLICK HERE to SIGN UP. You will be given the option to create an account on our system so you can return to add/change your chosen shifts. on our online calendar system. To be a featured business – sign up where you like and include your business / organization in that field on the form. If you chose to create a login on our system, follow these steps to return to the calendar to add or change shifts. If you don’t want to access the calendar directly yourself, email Kelly Bryer at Kelly@nhgsa.com or Naomi Halter at naomi@nhgsa.com and we will help. 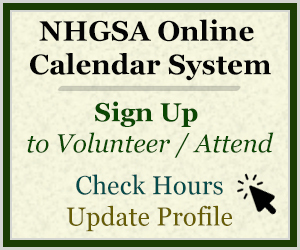 After you have created an account via the link above, CLICK HERE to go to NHGSA’s volunteer online calendar system and log in using your email address and the password you created when you registered. Once you are logged in, click the CALENDARS tab and then on the date you wish to volunteer or attend orientation. Click the Schedule Me button on your desired shift(s). Have questions or need help? E-mail Naomi at naomi@nhgsa.com. Sign up on the online calendars and then let Naomi (naomi@nhgsa.com) know that you would like to be the ‘Featured Business/Celebrity‘ for that shift. If no one has already signed up as the Featured Business/Celebrity, you can put your brochures, samples, etc. on the front counter, post an introduction sign, and use the video monitor if you would like. This is a great way to put yourself right in front of our primary guest market. Click here for an information sheet for our industry friends. NHGSA is able to offer a few discounted kitchenette rooms at Candlewood Suites for $100 per night on a first-come/first-served basis that are booked directly through us. Contact Kelly (kelly@nhgsa.com) to make your reservations. Military retirees or Active Guard and Reserve members can get inexpensive lodging at The Flyers Inn on Westover Air Reserve Base in nearby Chicopee. The telephone number is (413) 593-5421. There are dormitory beds available upstairs in the NH Building for $10 per night. Keep in mind that this is a shared space (big open room with cots, men and women separate, one shower for each side) and you have to bring your own bedding and towels. Contact Kelly (kelly@nhgsa.com) for more information. If you prefer to use your GPS or Google, the Big E employee parking lot on Western Ave in West Springfield can be reached by inputting 7 Western Ave. If that lot is closed or full, they’ll be using the next lot over, which you can reach by taking the next left onto Bliss St., and it will be immediately on the left. Check out our photos from last year!